Way back when in the baby days of this blog (December 2010), kale was a complete mystery to me. Since I was living in LA at the time, you’d think I would have been more tuned into this supergreen because of the city’s obsession with green juices. It wasn’t until a few months later when I was a bit more rooted in California that discovered the kale salad at Gjelina and I became completely obsessed. Kale can be quite unappetizing to the untrained eye, which was part of my initial hesitation. The gnarly texture and dark green, purple, or sometimes black colors can definitely be a turn-off, but hopefully this salad will turn you into a believer. The salad is substantial enough to eat as a full meal and it makes for a great side. 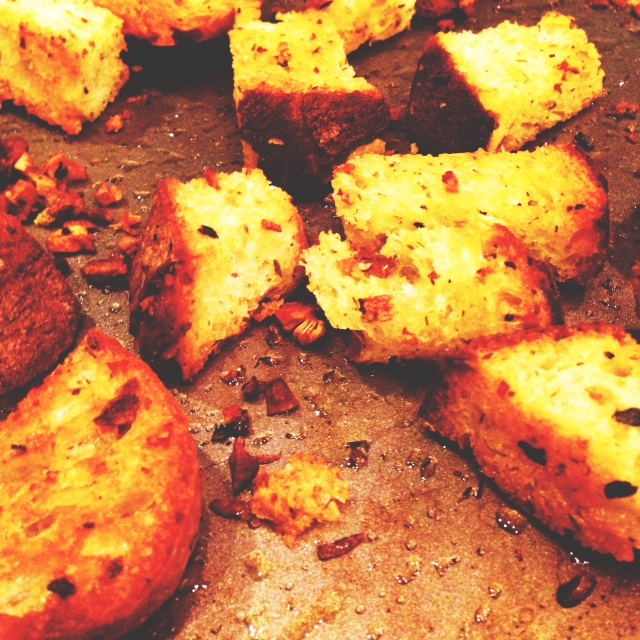 I dare you to leave the croutons on the baking sheet until you’re ready to serve them — it’s extremely difficult to do. Just be sure to make this with people who will love you in spite of, or perhaps because of, the crazy garlic breath it will give you. P.S. As amazing as this salad is, Molly and I will have SWEETS for you next week!!! Wash kale and trim kale from stalks, discard stalks and chop kale into ribbons. Slice radishes thinly with a sharp knife or mandolin. 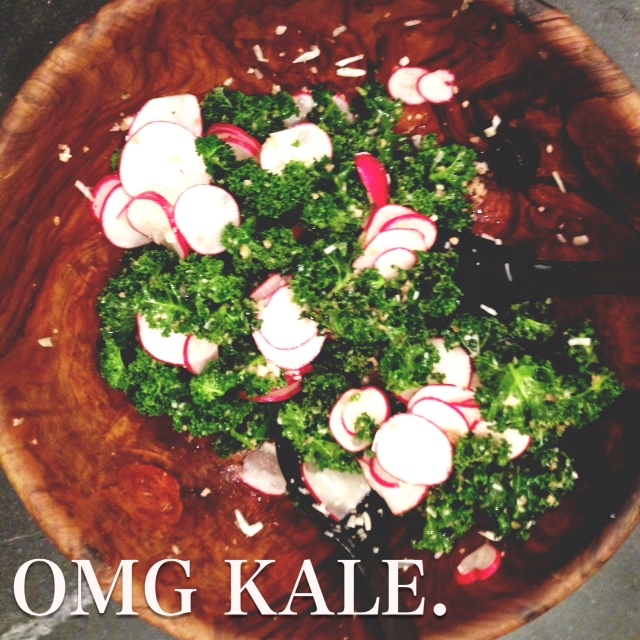 Place kale and radishes in a large bowl. Using a heavy knife, mince garlic cloves. If you have a mortar and pestle, it’s fun to break it out to turn the garlic into a paste. Place garlic in a small bowl and add olive oil, lemon, Pecorino, red pepper flakes, and salt and pepper. Whisk to combine ingredients and set aside. Melt butter in a small saucepan over medium heat. Transfer to a small glass bowl or glass. Add olive oil, garlic, dried dill, oregano, basil, and salt and pepper. Slice ciabatta into 1 or 2-inch pieces and place in large bowl. Pour butter and olive oil mixture over bread and toss with a spatula until bread is coated. Transfer on to a rimmed baking sheet and cook for 15 minutes, tossing occasionally until bread is golden brown. When croutons have cooled, add them to the bowl with the kale and radishes. Pour dressing over salad and toss to incorporate. Let salad sit for 5 minutes for the flavors to marry, then serve and enjoy in all its garlicky glory.